Recently in the afternoons, while my younger two nap, I’ve been listening to the most popular TED talks of 2015. TED talks are so great, they’re relatively brief but pack in so much new information and perspectives that challenge you to think in new ways. 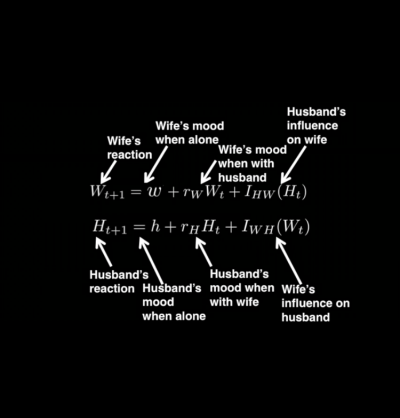 A few days ago I listened to The Mathematics of Love and after about 11 minutes, Hannah Fry starts talking about the mathematics of divorce — how researchers can use math to predict whether or not a couple will divorce. She explains how a psychologist observed hundreds of couples having a conversation, and discovered that one of the biggest predictors of whether or not a couple would get divorced is how negative they were in the conversation. 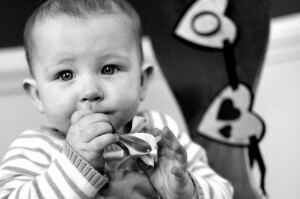 Using this information, the researchers could predict divorce with 90 percent accuracy. When I heard this, my heart began to pound. I often joke with Tom that we aren’t compatible, we’re complimentary. And I mean it, we really aren’t compatible. He’s an introvert, I’m an extrovert. He’s into RadioHead, I’m into Beyonce. He’s very math-minded and I only sort of know my multiplication times tables. Last night we were both on our phones; Tom was reading about Theoretical Physics. I was reading about Taylor Swift’s brother’s response to Kanye West’s new song. 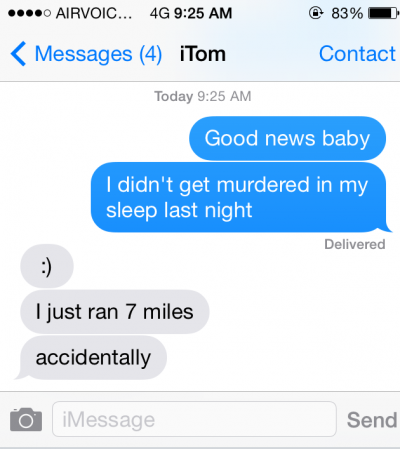 The last time Tom was out of town, he accidentally ran seven miles. We’re so, so different. We aren’t compatible, but we are well-matched when it comes to negativity. 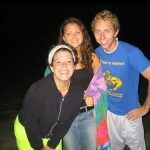 One day, just for fun, you should walk up to Tom and me and mention how much your Vibram FiveFinger shoes have revolutionized running for you. Watch while Tom distracts himself from the urge to roll his eyes by placing his hand over my mouth to physically keep the words “class-action lawsuit” from coming out of it. Tom and I, we’re not bright side people. What if that value is zero? I’m quirky and Tom loves me for it. 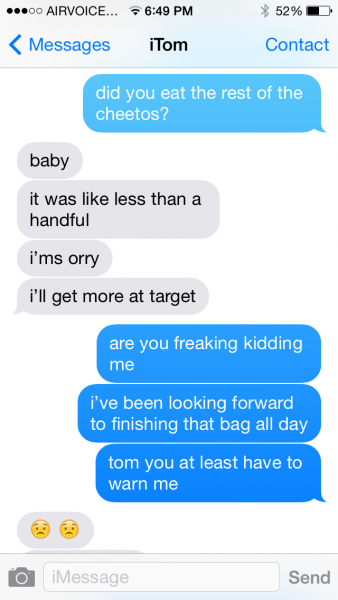 Tom is quirky and I badger him for it. Then she explains the results research. Wouldn’t you know, the best, most successful couples are the ones that have a really low negativity threshold. These are couples that don’t let anything go unnoticed, because they know how to handle conflict and are continually working on and repairing their relationship. Turns out, it’s good to allow each other to complain because it means trivial things won’t fester and become a big deal. I didn’t need math to tell me that Tom and I have good, open communication. It’s not perfect, but it’s working. And if that complicated equation wasn’t proof enough, just look at that text message. 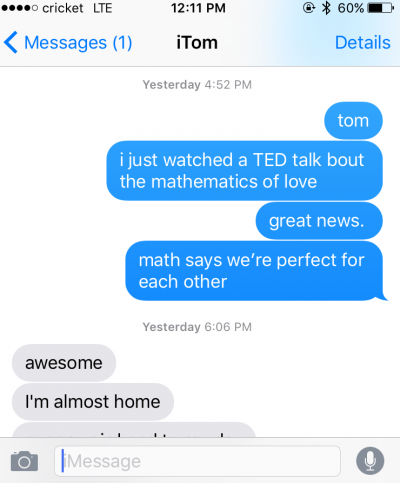 I text Tom about math and he replies (over an hour later) with the only thing his wife wants to hear at 6 p.m.: I’m almost home. We aren’t compatible; we’re complimentary. We aren’t the same; but we are perfect for each other.